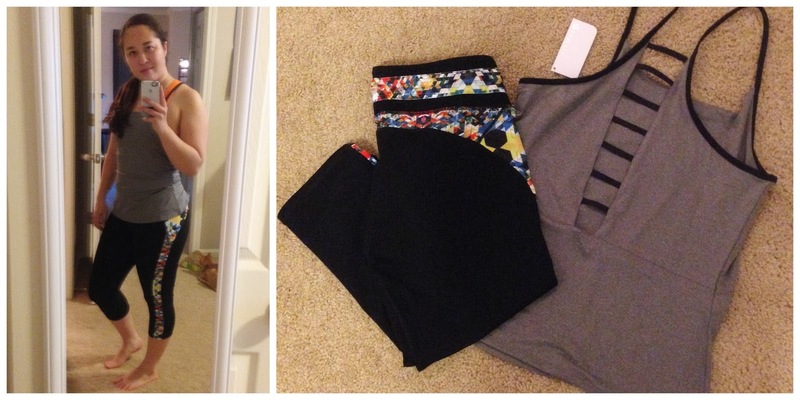 This month I earned my first FREE Fabletics outfit. With Fabletics you get points depending on what you buy, points for reviewing items, and HUGE points for referrals that make a purchase. *NEWS* They now have sizes up to XXL! Needless to say, I was super excited to know that this month's outfit would not be hitting my quarterly Budgeting Blogger kitty. When March 1st rolled around, I was online first thing in the morning to make my pick. I actually ended up choosing an outfit that came out after my February picks, the Hook. I wasn't a huge fan of the tank in its originaly color, but when I saw I could order it in a black/grey version I went for it. It ended up being a bit too fitted for me. My tummy is an area that I prefer to hide, and this tank didn't do me any favors. I'm sending it back for Fabletics credit, which I plan to use for a looser fitting top or maybe another pair of shorts. This month was a freebie, after all! I only want to keep items I love. What really drew me to this outfit were the pants. I have a couple of pairs of black capris that honestly need to be retired (or tossed). I wanted black pants, but something a little fun too, and I love the colorful pattern. There are so many colors, I can wear a tank or top of just about any color to match. THEY ARE AWESOME and quite possibly one of my new favorite things. They also make my booty look GOOD! Overall, I continue to be impressed by Fabletics. The quality is great, and the only time I've returned/exchanged items has been for style, not really a fit or quality issue at all. This is the first subscription I've really loved, and I always get excited for my next shipment. Disclaimer: I subscribe to Fabletics on my own dime, and did not receive anything in exchange for this review. I earned this outfit for FREE using referrals! If you're interested in signing up for Fabletics, I would LOVE if you'd use my referral link! For every two friends of you who purchase, I can earn an outfit. I'm so glad you love the pants because if you love=I love. I passed on the outfit because of the tank and went straight for the pants. They were so unique I just had to have them! I am including this month's purchase in my budgeting bloggers though. I didn't include the first one. I embrace my curves, but I still don't like tight tanks that hug my tummy. These pants seriously might overtake the camo capris as my favorites. I am a weirdo about liking to kind of match my workout clothes (I was NEVER this way when I was an athlete in HS/college) so these pants will match ALL THE THINGS!